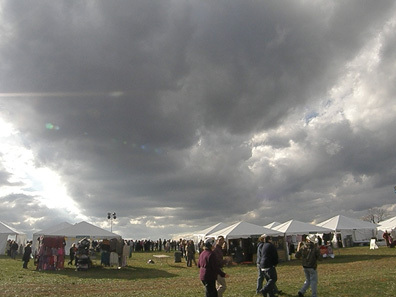 The VEAA members participated in these events during 2010. 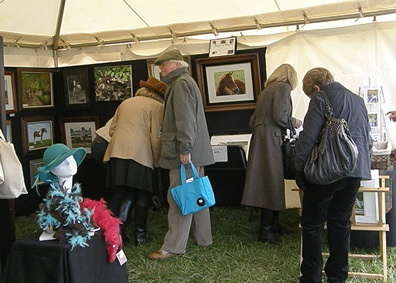 On Saturday and Sunday September 11 and 12 members of VEAA exhibited works at the two-day dressage competition at Rose Mount Farm in Spotsylvania, VA sponsored by the Virginia Dressage Association of Fredericksburg. 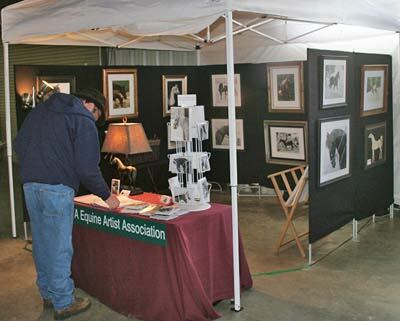 On November 6th VEAA members exhibited their works at the Montpelier Hunt Races near Orange, VA. Although there was some pretty dramatic cloud displays the weather held. As always everyone had a good time and set up and take down went smoothly. The races ran on time this year. 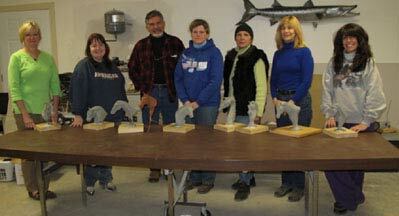 Eight artists participated, including a new member who works in metal sculptures. 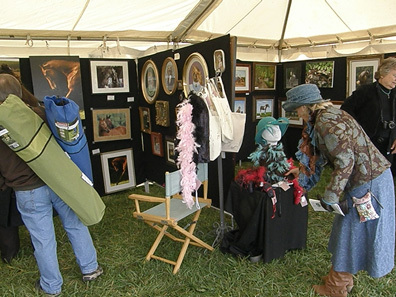 Wilma Bradner, David Everette, Renae Major, Elezabeth McNeel, Becky Knotts, Elaine Hurst, Linda Warshaw and John Rubino exhibited. 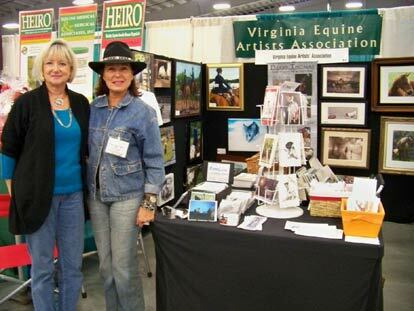 On October 29 - 31, at the home of Secretariat and the Meadow Event Park in Doswell, Virginia, VEAA artists participated in the Equine Extravaganza. A wonderful team of artists -- Willa Frayser, Kathy Sykes, Elezsabeth McNeel, Debby Thomas, Linda Warshaw and Jillian Chilson -- displayed in a cozy booth setting. This event was a great opportunity to get to know some wonderful artists. 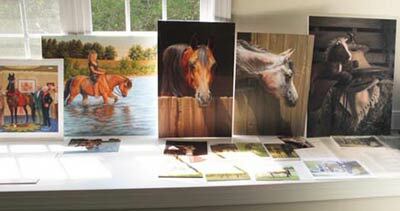 On Saturday, July 31 an open VEAA members' “Paint-Out” was held at the Hurst's farm in Port Republic, VA. The day started out a little drizzly, but cleared into a pleasant, although warm day. Only Elaine Hurst and Jillian Chillson participated in the event. 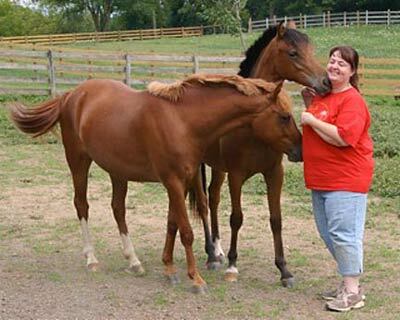 Jillian took many wonderful photographs of our horses, horses and ponies in training, our dogs, and the landscape. 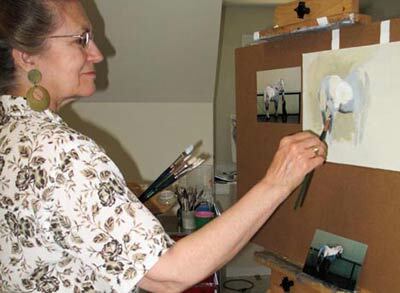 I painted my horse, Duncan, a Palomino Quarter Horse, since he is used to being a model. 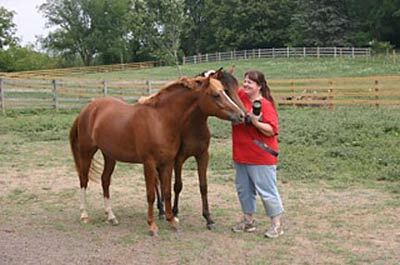 Jillian and I had lunch in our tack room, and had a great time talking. Everyone missed the watermelon I brought out. 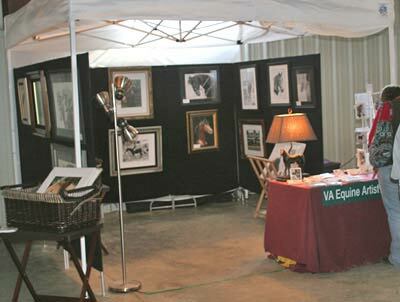 On June 5th VEAA members joined the "Belmont Party" with an exhibition at the barn at Foxcote in White Post, VA. 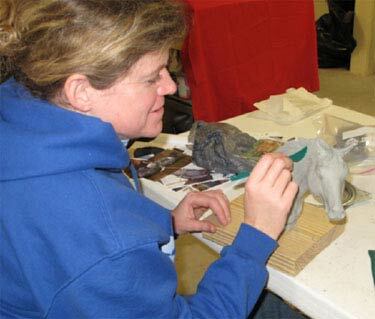 The event is held annually to support the Blue Ridge Hospice. Jillian Chilson, David Everette, Wilma Bradner, Renae Major and Debby Thomas participated in this successful event. 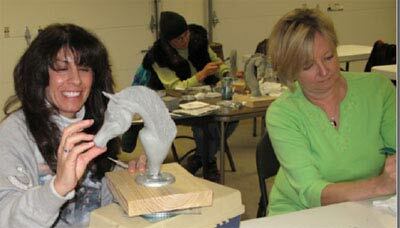 Participants of the workshop with Lynn Maderich on June 18-21 found it incredible. By the end of the four days everyone felt like friends, albeit exhausted friends. Each day was a step in the way the Atelier method is taught. 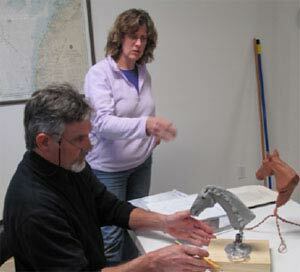 Participants learned the overall picture of the process as well as all the basics and the rule to practice and practice. 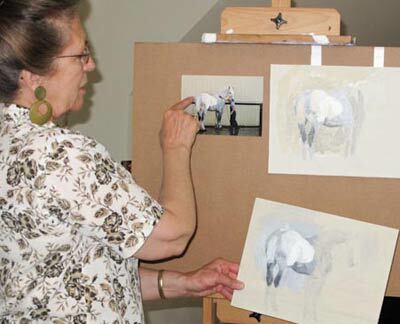 The first day was drawing, the second value painting in black and white, the third a colored painting start (several steps) and the fourth day a continuation of the colored painting (several more steps). 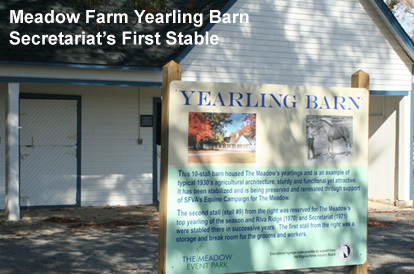 Lynn shared that she would come again or even possibly on a yearly basis if there is enough interest. 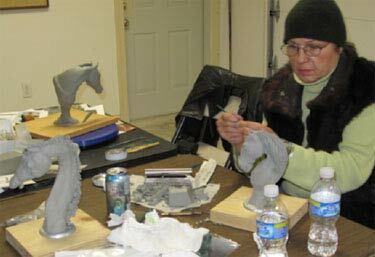 "Sculpture Workshop with Robyn Ryan"
On February 27 and 28 Willa Frayser hosted seven artists for a sculpture workshop with Robyn Ryan at her home in Ashland, Virginia. A wonderful time and learning was had by all! "VEAA Great American Trail Horse Sale"
On Friday and Saturday February 26 and 27, 2010, VEAA members Eleszabeth McNeel, Claire Owens and Kristin Waters Wise displayed their artwork during the Great American Trail Horse Sale at the Virginia Horse Center in Lexington. 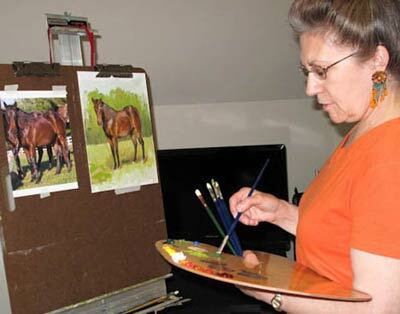 There was good foot traffic and numerous people admired the artwork on Saturday – the day of the clinics, trail competition and sale – and there were a few small sales. 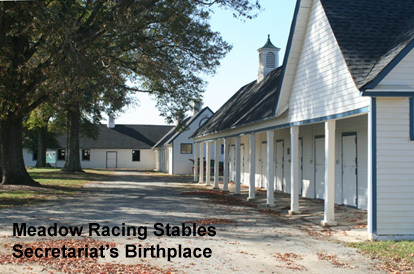 When the economy improves, this could be a good sales venue.